If you think that your child has a hearing loss, you might be right. The following checklist will assist in determining whether or not your child might have a hearing loss. Please read each item carefully and check only those factors that apply to you, your family or your child. More than 3 million American children have a hearing loss. An estimated 1.3 million of these are under three years of age. You, the parents and grandparents, are usually the first to discover hearing loss in your babies, because you spend the most time with them. If, at any time, you suspect your child has a hearing loss, discuss it with your doctor. Your child’s hearing can be professionally tested at any age. Computerized hearing tests make it possible to screen newborns. Some babies are in a higher risk category for having hearing loss than others. If you check any items on this list, your child should have a hearing test as soon as possible. All children should have their hearing tested before they start school. This could reveal mild hearing losses that the parent or child cannot detect. Loss of hearing in one ear may also be determined in this way. Such a loss, although not apparent, may affect speech and language. 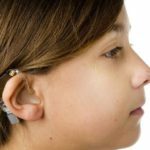 In contrast to temporary hearing loss, some kids have nerve deafness, which is permanent. Most of these children have some usable hearing. Few are totally deaf. Early diagnosis, early fitting of hearing aids, and an early start on special educational programs can help maximize the child’s existing hearing. [ ] Does not babble, or babbling has stopped. If you have checked one or more of these factors, your child may be at risk for hearing loss. At risk only means there is a better than average chance of a hearing loss. If your child is at risk, you should take him or her for an ear examination and a hearing test. This can be done at any age, as early as just after birth. If you did not check any of these factors but you suspect that your child does not hear normally, even if your child’s doctor is not concerned, have your child’s hearing tested by an audiologist and when appropriate, his or her speech evaluated by a speech and language pathologist. If no hearing loss exists, the test will not have hurt him or her. However, if your child does have a hearing loss, delayed diagnosis could affect speech and language development. This leaflet is provided as a public service to parents who are concerned that their child might have a hearing loss. It is not a substitute for an ear examination or a hearing test. Hearing loss can exist in children even though none of these checklist items are present.